I have three children, and at the time of this post they are ages eight (boy), six (girl), and two (boy). 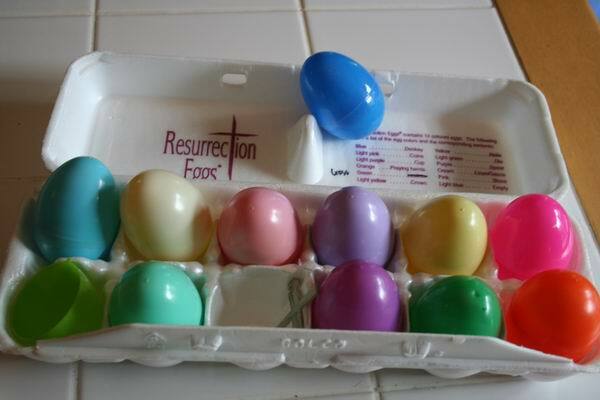 A friend asked me the other day if we do any kind of Easter devotions, and I said, “No, not really.” But then another friend mentioned Resurrection Eggs. Oh yeah, we do those. I forgot. Then I remembered we usually also do Resurrection Rolls. And sometimes, a Passover seder dinner. And occasionally, dye Easter Eggs. Though I guess that’s not a devotional activity, but it’s a fun Easter activity. It’s just that Easter sneaks up on me every year, and I end up pulling things out of our spring box in the pantry the weekend before Easter. I never feel prepared. Nonetheless, here are some of our favorites. baby brother, “No, buddy, that’s light purple. This is dark purple.” Precious. We might go over the Resurrection Eggs again at dinner one day this weekend or next week (sometime it ends up being after Easter, but that’s okay), and really explaining each one, or having the kids see if they can explain each one. Some years my husband or I have read the Easter account from the Bible. Anyway, this is a super-easy, fun activity that can be as involved as you want it to be. You could do one egg a day leading up to Easter if you were so inclined. I got these at Mardel and it’s not too late to get them this year, or I bet they’ll be on sale next week after Easter. Have fun! I was going to find a good Resurrection verse, but this is the one that was on Bible Gateway just now, and it’s perfect for today, Good Friday. Isn’t that great? I think we’ll memorize it. We’ve been having severe fighting issues lately and could use some reminders of brotherly/sisterly love.